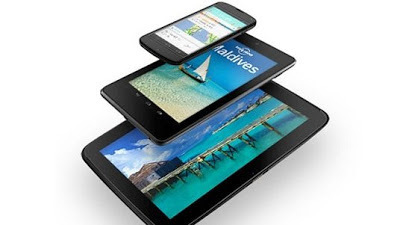 Tablet shipments are currently on a tear, with multiple research agencies rushing to upgrade their estimates for the next year. The behavior of research agencies & their flawed early predictions seem to be very similar to what we saw in the early days of the smartphone market. 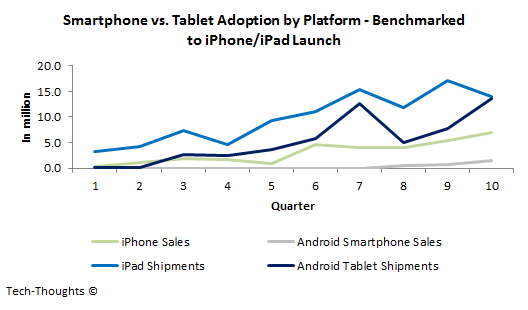 This makes me wonder if the growth in tablet adoption is comparable to the initial surge we saw in smartphones. It is important to understand that ever since the iPhone and Android were launched, the market was segmented into legacy smartphone platforms (Blackberry, Symbian & Windows Mobile) and modern smartphone platforms (iOS, Android & Windows Phone). We can say this with a certain degree of confidence, as consumers upgrading their smartphones would almost always move from a "legacy" platform to a "modern" platform. Platform shifts, after this change, were almost always within "modern" platforms. Since Windows Phone has had practically no impact on the smartphone market, the battle of modern smartphone platforms devolved into the Android vs. iPhone battle we see today. 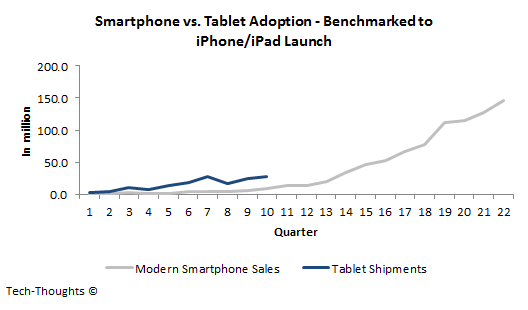 Therefore, to analyze adoption trends, we need to compare the growth in tablet shipments to the growth in modern smartphone shipments, and not those of legacy smartphones. As we can see, adoption of both the iPad and Android tablets has outpaced that of the iPhone and Android smartphones, over the first 10 quarters. This suggests that the growth in tablet adoption isn't driven by the popularity of a single product, but is a broader trend. Initial Resistance to Touchscreen Input - Early sales growth of modern smartphones was relatively muted as consumers were still not familiar or comfortable with touchscreen technology. As the iPhone gained prominence, consumer awareness grew and helped bolster Android smartphone sales as well. This has helped touchscreen operating systems evolve into a mainstream technology, which caused "friction-less" tablet adoption among consumers. App Growth - Android and iOS have themselves evolved into mainstream platforms, not just from the perspective of consumers, but for developers as well. As the application base for each platform grew, the functionality offered made consumer purchases more practical. Since developers were already sold on the platforms, app growth for the iPad (and possibly Android tablets) was much quicker than before. Fast Follower Approach - The first Android smartphone hit the market 6-7 quarters after the launch of the iPhone, but Android OEMs didn't wait for Google to make a move before they decided to compete with the iPad (this could be considered a flaw in the chart above as well). While this put their products at a disadvantage early on, it did help create greater awareness in the market about tablets. Today, the surge in tablet growth is being driven by the availability of high quality product options, at lower price points. But adoption would never have been this quick if modern smartphones hadn't paved the path first.